Another season, another heaping helping of Sooner fans' favorite weekly preview series, "What to Watch." Our first edition of the 2010 season finds OU hosting dyed-in-the-wool cupcake Utah State. Lest you fear this season's opener has the potential for the BYU-like disappointment of a year ago, know that while both teams hail from the land of Joseph Smith, the similarities between the two pretty much end there. The Aggies played the role of WAC punching bag last season, finishing 4-8 overall and 3-5 in conference games. A total of 16 returning starters may signal improvement in coach Gary Andersen's second campaign in Logan, but USU shouldn't offer much resistance here, especially with a defense that ranked in the 100s nationally in all major categories. Even so, USU senior quarterback Diondre Borel leads a sometimes potent offensive attack that will provide a nice tune-up for next week's visit from the Florida State Seminoles. Plus, it's a game that actually counts for something, which makes it a godsend this time of year. The Sooner offense will go as their big uglies go this season, and that will depend heavily on the touted left side combo of guard Stephen Good and tackle Donald Stephenson. Good has the strength to be a devastating run blocker. However, his clumsy feet seem to have kept him from maximizing his considerable potential so far. On Saturday, watch how he moves on run plays in particular. As for Stephenson, this will be the first opportunity most OU fans have had to even see the mysterious Stephenson in action. Unfortunately, the Aggies don't have a pass rusher who will provide much of a challenge. 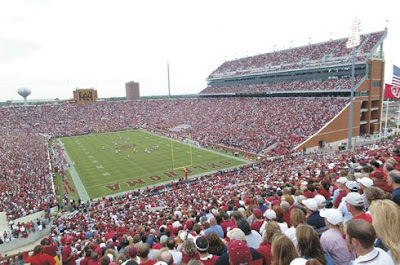 With maestro Sam Bradford running the show in 2008, OU's overall experience enabled the offense to operate its no-huddle attack at breakneck speed. By rushing to the line of scrimmage, the Sooners put defenses on their heels, often creating mass confusion. Additionally, the pace of OU's offense prohibited opponents from substituting liberally, allowing Bradford to exploit mismatches all day long. All the chemistry issues last season seemed to discourage offensive coordinator Kevin Wilson from really pushing the tempo. The Sooners kept the no-huddle part in place, but they definitely weren't moving at the same speedy pace. OU brings back a far more experienced group on offense in '10, which should allow Wilson and quarterback Landry Jones to get back to operating at warp speed. If they rev the engine against the Aggies, note how it affects the execution of the offensive line especially. The green group of blockers forced into service in '09 has given the Sooners a leg up a year later in terms of developing depth up front. Of the 10 players currently listed in the two-deep, six started at least one game last season. Two more linemen on the roster, Cory Brandon and Tavaris Jeffries, received starting nods in '09, although neither is expected to contribute much this go-round. The word out of fall camp is that offensive line coach James Patton intends to leverage that newfound depth to keep the o-line fresh throughout games and, hopefully, prevent the slew of injuries that plagued the Sooners last year. Watch Patton's substitution patterns, particularly in the first half which should give a better indication of who will be contributing more this year. The defensive interior poses one of the biggest questions facing OU this year, as defensive line coach Jackie Shipp tries to replace all-everything tackle Gerald McCoy with an injured vet and a pastiche of youngsters. Senior Adrian Taylor sounds doubtful for Saturday night. If you buy the latest depth chart, Casey Walker and Stacey McGee will start off at defensive tackle, with sophomore Jamarkus McFarland subbing in. Without a standout in that group, look for Shipp to go for a "strength-in-numbers" approach with all three taking a roughly equal numbers of snaps. The aforementioned situation at d-tackle and OU's preponderance of pass rushers may have defensive coordinator Brent Venables getting a little creative in passing situations. For instance, maybe slide beastly Ronnell Lewis down to end and move Jeremy Beal inside next to a tackle? Also, exciting freshman defensive back Tony Jefferson is supposedly starting at nickel back. This will be OU fans' first real opportunity to see Jefferson in action, and the San Diego native has drawn high praise from the coaching staff. No matter who's out there, don't expect the Sooners to go too exotic. Venables will likely stay with plenty of base coverages and sets with FSU on the horizon. When you have a great receiver like Broyles, it becomes easy for quarterbacks to develop tunnel vision on passing routes. Given that Broyles was easily Jones' most reliable option last year, the possibility that he could get just a little too attached to his favorite target definitely exists. However, Broyles has graduated from emerging to legitimate star after last year. Opponents will be designing their defensive game plans to stop the junior pass catcher this time around – he won't be taking anyone by surprise. As great as Broyles is, Jones simply can't afford to lock on to one guy if the Sooner O is to progress this year. Of course, that's not all on the quarterback. OU's other receivers also need to give their signal caller a reason to trust them.